During the Late Triassic, some huge reptiles lived on land, others lived in the water, and it's long been believed that they didn't typically interact with one another. But the discovery of a tooth lodged in a 220-million-year-old thighbone reveals that two prehistoric carnivores frequently skirmished across their respective turfs. Scientists at the University of Tennessee (UT) say the tooth, which belonged to a semi-aquatic, crocodile-like phytosaur, was buried about two inches deep in the bone of a terrestrial rauisuchid, a 25-foot-long dinosaur that was four-feet-high at the hip. "To find a phytosaur tooth in the bone of a rauisuchid is very surprising. These rauisuchids were the largest predators in their environments. You might expect them to be the top predators as well, but here we have evidence of phytosaurs, who were smaller, semi-aquatic animals, potentially targeting and eating these big carnivores," said Stephanie Drumheller, an earth and planetary sciences lecturer. To study the tooth without destroying the bone, the team partnered computed tomographic data with a 3D printer and printed copies of the tooth. This, along with an examination of bite marks, revealed a story of multiple struggles. The team found tissue surrounding bite marks illustrating that the rauisuchid was attacked twice and survived. Evidence of crushing, impact, and flesh-stripping but no healing showed the team that the animal later died in another attack. 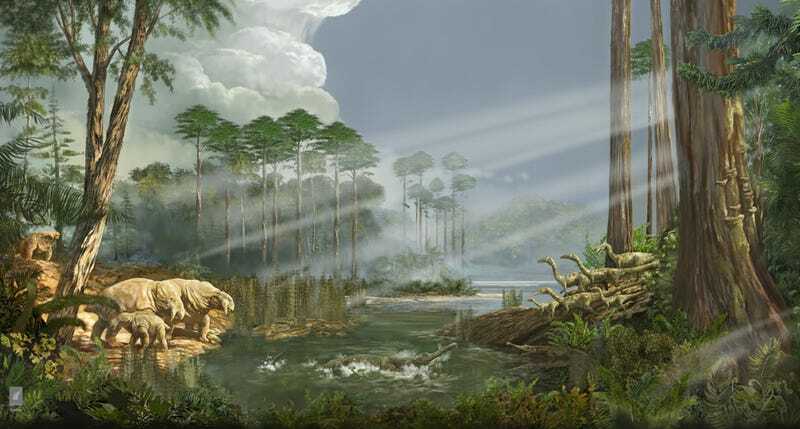 "This research will call for us to go back and look at some of the assumptions we've had in regard to the Late Triassic ecosystems," Stocker said. "The aquatic and terrestrial distinctions made were oversimplified, and I think we've made a case that the two spheres were intimately connected." "Both of the femora we examined came from some of the physically largest carnivorous species present at both locations. Yet they were targeted by other members of the region—specifically phytosaurs," said Drumheller. "Thus, size cannot be the only factor in determining who is at the top of the food chain."